In the US, around 28.8 million adults could benefit from using hearing aids. Although the vast majority choose not to take advantage of the increased quality of life hearing aids provide, those who do can look forward to a happier, healthier future. If you’ve decided to seek treatment for hearing loss, you will also need several hearing aid accessories. These will help you get the most out of your new hearing aids and keep them in tip-top condition. But don’t worry, maintenance isn’t time-consuming or complicated, and it will ensure your hearing devices always provide the best quality sound. 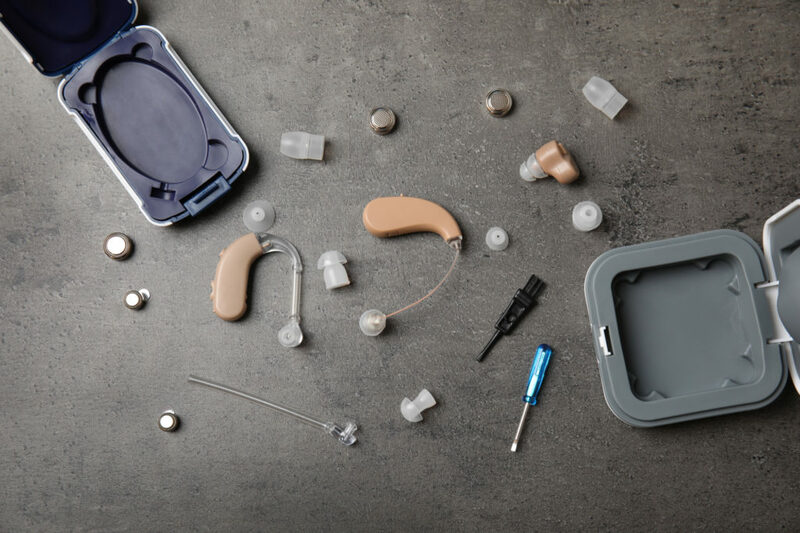 From cleaning kits to the latest in hearing aid tech, check out our picks for the best hearing aid supplies and accessories. Without power, even the most advanced hearing aids can’t do their job. As such, batteries might be one of the simplest yet also most vital hearing accessories. Making sure to always have a few sets of spare batteries available can be a real lifesaver if you’re pushed for time. Whether your hearing aid runs on rechargeable or disposable batteries, a crucial part of hearing aid care is to make sure your batteries always have enough power. It can be tempting to let your batteries run down, but overusing the batteries can damage hearing aids and cause corrosion. A hearing aid battery tester will help you avoid letting this happen. Being able to check the battery life of your hearing aids also means you won’t get caught off guard with a low battery halfway through the day. And, once you learn how much battery power you need for a full day, you’ll know whether you need to swap your batteries for some new ones before you head out. Many people worry about losing their expensive hearing aids. As a result, adults and children who enjoy an active lifestyle either leave their hearing aids at home or feel forced to stop doing the activities they enjoy. Luckily, there are many options for hearing aid clips and straps which help to keep hearing aids in place. These accessories give you peace of mind, allowing you to continue enjoying your favorite activities without compromising on your ability to hear. We recommend Ear Gear, SafeNSound Strapz or Otoclips for securing hearing aids in place. And SafeNSound Duo is one of the best hearing aid attachments for glasses. Modern hearing aids are tiny. Although this makes them more discreet, it also means they can be tricky to clean. Since regular cleaning is essential for keeping your device in prime working condition, a specialized cleaning and maintenance kit is one of the most useful hearing aid supplies. These kits usually contain everything to clean all hearing aid parts, including a tube and vent cleaner, wax removal brush and picks, and a battery replacement magnet. Ear wax is a leading cause of damage to the electrical components of a hearing aid. Although cleaning kits can help to remove the common problem of wax build-up on hearing aids, wax filters can often be a more effective solution. You will still need to clean and maintain your hearing aid, but filters will help prolong the life of your device whilst ensuring crisp, clear sound at all times. As well as keeping hearing aids clean, it’s also crucial to keep them free from moisture as they work best when they’re dry. Since humans are around 60 percent water, hearing aids can quickly collect moisture. This is especially the case if you live in a humid region or spend a lot of time in environments with excessive moisture. Hearing aid humidifiers help to remove moisture, stopping this from damaging the sensitive workings of a hearing aid. Many people first become aware that they may have hearing loss when family members complain about the TV volume being too loud. TV streamers, which can also link up to MP3 players and computers, work with Bluetooth to send a direct signal to your hearing aids. This means you can listen at a comfortable volume for you while your family listens at a comfortable volume for them. Hearing aid voice transmitters help to give hearing aids a boost in situations like lectures and conferences. Often, these work with receivers to overcome background noise and reverberation to improve sound quality. Voice transmitters are also useful for everyday situations when you’re out with a friend or relative in a busy public environment. Clipping a voice transmitter to their clothing ensures you’ll be able to hear them throughout the day, no matter how close or far away they are from you. A user-friendly hearing aid remote control allows you to adjust the volume or setting on your hearing aid without having to fiddle with the tiny buttons on your device. Working with wireless technology, these handy remote controls mean you can easily switch from directional sound to ambient or regulate your device’s volume according to your environment at the touch of a button. While remote controls are great hearing accessories for those without smartphones, there are also many free apps which allow you to control your hearing device. With these apps, you can increase the volume, change programs and settings, and even perform battery checks through your phone. Thanks to this technology, making discreet adjustments to your hearing aid throughout the day is now a whole lot easier. While buying the right hearing aid is essential, these hearing aid accessories will help to ensure your devices are always in perfect working order and provide the best sound quality possible in any given situation. And, for more ways to get the most out of your hearing aids, check out these tips. Or, feel free to call us on (870) 331-8528 with any questions or queries.